The client was looking for a consolidated support for its security product. The worlds most downloaded security product demanded an unmatched support service. The team was expected to resolve technical as well as support related issues. This required different skillset from the people working on this project. Though the team was small it was to take care of requests for variety of operating systems and devices making it very complex for the team to work at optimal rate with high ticket closure rates. e-Zest learnt the exact requirement for the support from the client. The team was specifically chosen and were given rigorous training on the subject matter so that they are well aware with maximum scenarios that they might encounter. The right combination of the team helped the project steered through all the learning, handholding and actual delivery of the tech and service support. In these types of projects, it is very important to have robust processes and their effective implementation. Having right set of processes helped team optimize their time and energies which resulted in addressing periodic spikes in the requests without much efforts. A strong KMS system has been deployed to get to the resolution in shortest possible time and without too much of trouble. Since a small team was looking after wide portfolio of activities having a functional and updated KMS was the key. A dedicated product sustenance support team was prepared to address technical as well as customer support needs from onsite as well as offshore location. The team has shown tremendous zeal and dedication in resolving the issues of the end customers. 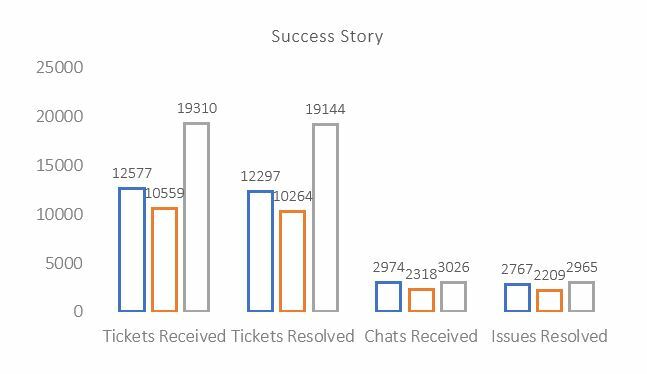 The client was really happy as team could successfully address the spike in ticket. This has helped the client portray himself as a premium player in its own industry in terms of product and service commitment.